A few weeks ago a good friend came to town, and with him came a connection to a guy who owned a backcountry hut up by the continental divide. Once invited, A and I were psyched about the chance for an overnight adventure. There was only one problem: just days before I had finally seen a podiatrist about my still sore foot/ankle situation, and he had put me on a strict regime of advil, ice, and no unnecessary physical activity for the next week. The hut was only available for one night during the time our friend was in town, so we were faced with a decision: figure out a way to get me to that hut without ‘unnecessary physical activity,’ or skip it. 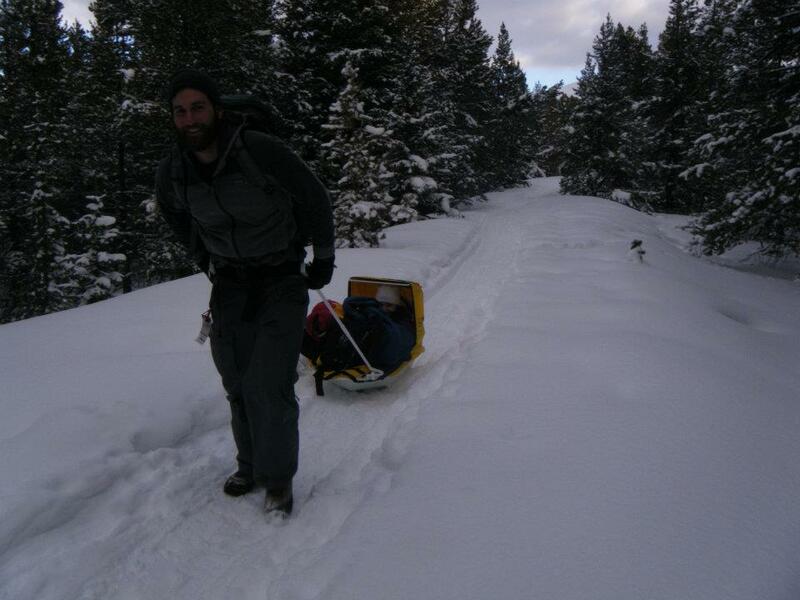 Not one to back down from a challenge, the guys put there heads together and came up with a plan: people use sleds to haul gear into the backcountry all the time, why not use it for me? 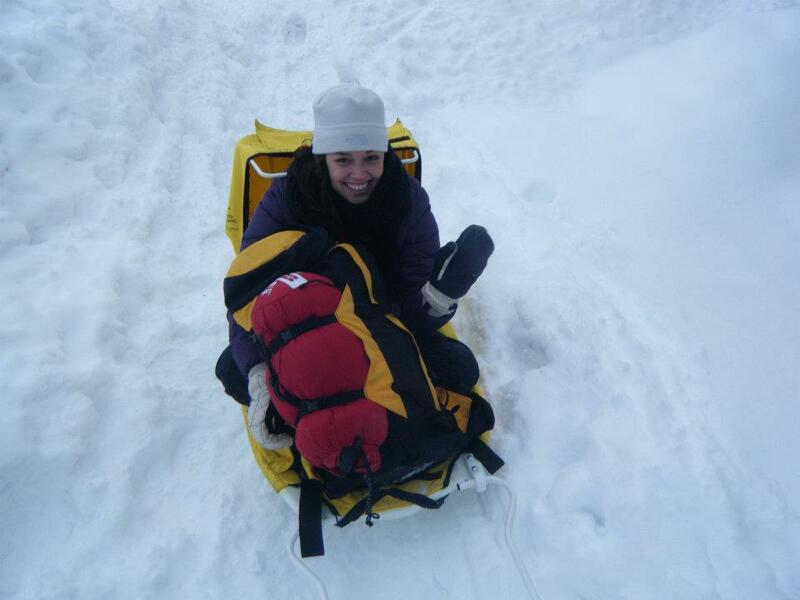 So after a late morning start and a rather large lunch, we set out on a wild goose chase to find a sled. The boys were very tactful about the situation, for the most part not revealing we needed the sled for a person rather than gear. After checking every outdoor shop and thrift store in town, we finally found a place at the nearby ski area that would lend us a sled, and even better, for free. The catch was this: it wasn’t exactly a gear sled the guy could lend us. It was a sled for carrying a child while skiing (think like those bike attachments for kids but in sled-form). It came with a little tent, a very small seat, and a roller-coaster like seat belt. The guy assured us with a smile that he had carried six cases of beer in the sled before (assuming we were using it for the same purpose) and asked how many of us were going up there. There was a slightly awkward pause when we told him it would just be the three of us. I like to imagine he decided we were really awesome before handing over the sled for good, but he probably just thought we were crazy. And considering what we were planning on actually putting in the sled, we kind of were. Finally came the time for me to load in. Because of the covered, very small seat, I had to do a little maneuvering to fit in a way that wouldn’t make the sled tip over, but it actually worked! We loaded some extra gear on top of me on off we went. I think the boys underestimated just how hard pulling that sled would be. I imagine between me and the gear they were pulling almost 200 lbs. It wasn’t long before A had stripped down to a very sweaty t-shirt. And it wasn’t long after that before he switched with our very good sport of a friend. The guys alternated pulling me while I enjoyed the scenery and felt slightly guilty. We all felt totally ridiculous. It was a while before the laughing stopped. It seemed like such a good idea in theory, but in practice we all looked so silly that I prayed the trail would be empty. A pulls while hysterical. It was much funnier in real life. The hut was barely ‘backcountry.’ It was supposed to be only a mile from the trailhead, which was why the idea of sledding me in seemed reasonable in the first place. Plus everyone we had talked to described it as very easy to find. But an hour in and we were still going, and we hadn’t found the turn-off we knew we were supposed to encounter early on. Neil ran ahead. Nothing. We backtracked and explored the only two turn-offs we had passed – both of which amounted to little. By sunset I had started walking too. 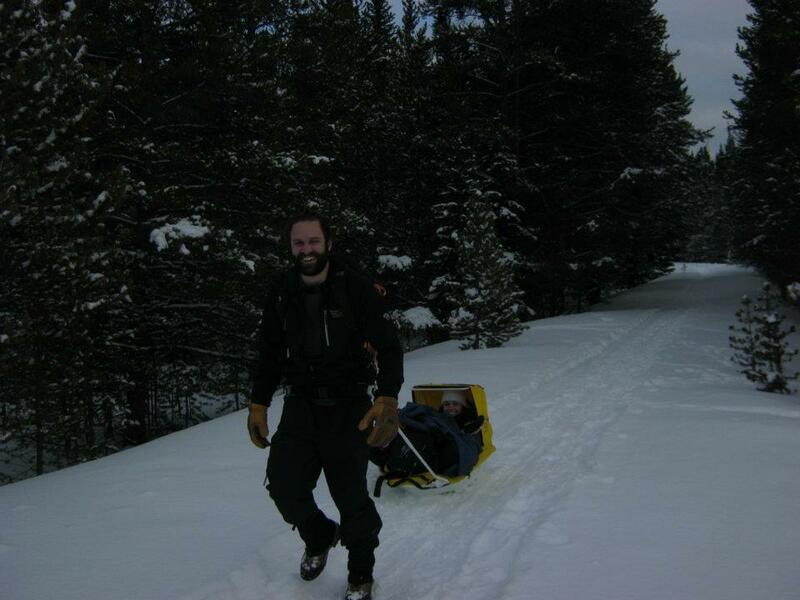 It was too cold to sit in the sled any longer and I felt bad the boys had carried me as far as they did. We were all in good spirits though, as we watched the alpine glow sweep across the snowfields of the mountains we trekked between. Before we knew it, the tiniest sliver of a moon was high in a dark sky. Austin ran up to investigate another trail while Neil and I waited with the sled. As I looked up through the trees on that mountain I realized that at this altitude I may well be as close to the stars as I’ve ever been on solid ground. They shined bright. I felt warm. The nice thing about being in the mountains in the winter is that the snow is very forgiving with what little light there is. We all had headlamps, but truly, the starlight and that tiny sliver of moon was enough to illuminate the ground around us so that we did not need them. Eventually though, we decided we needed to go back. Orion shined huge and bright above the clearing where our car sat waiting. And as we loaded our sled into the trunk, we noticed a sign directly behind our parking spot. We had gone down the wrong trailhead. It was the most fun I’ve had all winter. o my god!!!! i hope the guys thik the same!